If you, the owner, like talking to people and you have a good looking Clumber who loves meeting new people then you might like to join our Breed Promotion team. It might not be the first activity you think of but it is an important one for the breed. 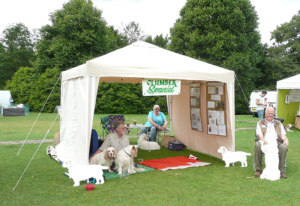 We attend various ‘Meet the Breed’ events such as Discover Dogs, Game Fairs and Pet Shows where we meet people who want to know more about the Clumbers. Most of the people we meet are trying to choose what breed they would like and need more information before they decide, whilst others ask about activities such as showing or working. We also see a lot of people who have known Clumbers in the past and just want to spend a few minutes reminiscing about the breed. The dogs who attend do not need to be perfect show specimens but they should be well groomed and typical of the breed. The most important thing is that they have a good temperament, behave well with children and can cope in what can be crowded situations. At pet shows we offer the opportunity for children to be photographed with our dogs and we have stickers made of each dog on the stand that they can take away. We do prefer volunteers at game fairs and country shows to have some experience of working with their Clumber. We provide lots of information and support to help answering all the various questions we get asked – and if we don’t know the answer we make a point to find out and pass on the information.